We know steering columns Several performance packages and upgrades are available. Exclusive Omega GM Steering Joint Design This steering column offers an improved GM steering joint design with Delron bushings that offers the best performance. This improved ball joint is only found on higher end steering columns that can cost several hundred dollars more. Based of modern vehicle technology that offers increased torsional strength while improving road feedback. Go with what the pros pick These steering columns kits are the choice of the top builders and racers who depend on quality and performance. Looking for the perfect fitment The steering column unique design has been proven overtime to fit your vehicle with optimal results. This makes this kit ideal for all. For almost 40 years, Steves House Of Speed has been satisfying customers' needs by providing them with the parts they need at the lowest prices. We house the most comprehensive collection of parts and accessories in the world. If your parts-shopping experience is a hit-or-miss or simply unsatisfactory, switch over to us. You won't regret it! We offer the Right Part and the Perfect Fit!!! Other auto parts stores carry only a couple of thousand parts in stock. Sometimes, it can get very frustrating when you spend time, sweat, and gas only to be told that they don't have what you need. Well, you'll never experience that here at Steves House Of Speed! Our huge warehouse has over 1 million parts for over 25 million different vehicles. Add to that more than 100,000 accessories for over 6 million rides and what you get is the right part with the perfect fit. No more frustration, no more stalled restoration projects, no more having to wait to get back on the road! You'll find what you want right here. We stock products that are just as good (or better) than those your ride came with. If you need your parts fast, then you'll feel right at home here with Steves House Of Speed. 1981 - 1988 Monte Carlo 32 Chrome Tilt Steering Column No Key Floor Shift. This makes this kit ideal for all different types of performance installations. These steering columns are available in several configurations, including keyed, push button start, floor shift, chrome, paintable, and more Please check out the specs below. If you would like to upgrade your kit please check out our store. Steering Column Details Application 1981 - 1988 Monte Carlo Levers Deluxe Knobs Deluxe Hub Heavy Duty Horn Button Improved Design Bushings Delron GM Internals YES Tube OD 2 Inch Rag Joint Eliminator Yes Diameter 2" Shroud Length 7.25" Main Shroud Length 3.5" Tapered Shroud Length 3.75" Column Length 32" Output Shaft 1.25" long 1" DD Steering Wheel Input 3/4 x 36" Spline Shroud to Wire Port 15.5 Service Grade 45D68 Finish Chrome Feature Includes Billet Turn Signal, Hazard. Feature Includes Prewired Turn Signal Switch Feature Includes Prewired Hazard Switch Feature GM Plug Feature Color Coded Wires Bushings Sealed Anti Rattle Bushing Grade 5G Snap Rings Reinforced Turn Signal Arms Included Collar Anti-theft lock guard 5 Way Adjustable Tilt lever Canceling cam/self canceling turn signals, 4-way hazard switch Cover Anti-theft cover 3 7/8 OEM/GM-type wire plug Ships Ships from U. Instructions Manual This product was designed and engineered in the USA. As like all modern auto parts this steering column is manufactured from a variety of new parts from a variety suppliers around the globe. All parts meet or exceed OEM standards. Please note this steering column may not bolt in directly to your vehicle. You may need additional brackets and parts for installation. It is designed to meet modern standard and offers improved safety and performance to ensure maximum strength and adjustability. This is an upgraded aftermarket performance column that includes a 1 DD rag joint eliminator output shaft. This output shaft delivers better performance and safety over the oe rag joint. 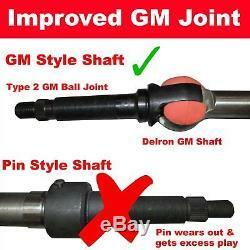 Depending on your installation you may require additional U-joints and steering shaft to mate to your vehicle. You may also need a steering shaft for your application. Depending on your vehicle, you may also need a steering wheel adapter. Stock photos may not be an exact representation of the item. Please read all product info, descriptions and terms before purchasing. All of your items fit in one box. 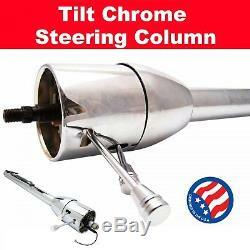 The item "1981 1988 Monte Carlo 32 Chrome Tilt Steering Column No Key Floor Shift" is in sale since Wednesday, August 22, 2018. This item is in the category "eBay Motors\Parts & Accessories\Car & Truck Parts\Suspension & Steering\Other". The seller is "steveshouseospeed" and is located in Patterson, New York.